The Avengers 2 "Age of Ultron" official trailer is out and it is SUPER Creepy! Can't wait for the actual movie! 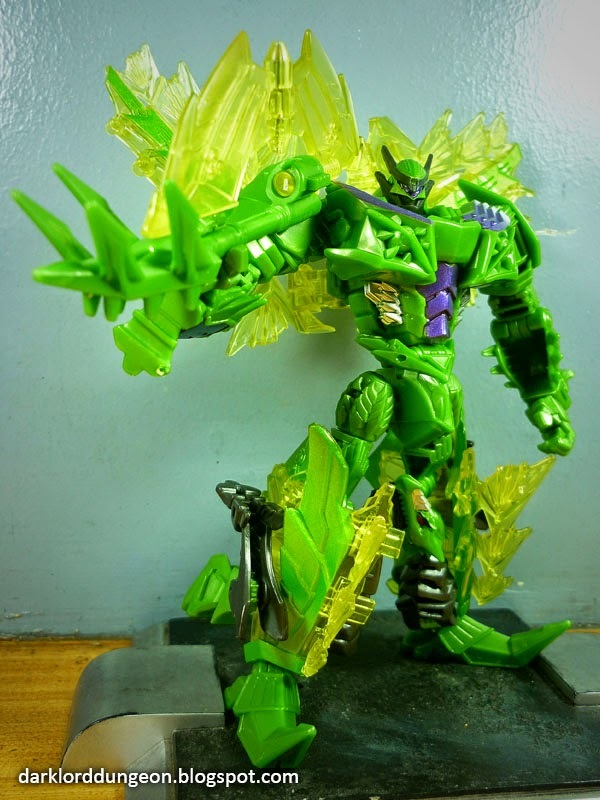 Presenting the Snarl from the Transformers Age of Extinction - AOE - toyline. AKA the Dinobot that probably seemed least menacing in dinosaur mode that he wasn't included in the movie and was instead replaced by two raptor looking Dinobots - Scorn and Slash. But then history has never been kind to Snarl. As we've discussed before, his name was co-opted by Slag in other toy-lines of the Transformers simply because "Slag" somehow over the years ended up being a derogatory term for women. Probably simply because Dinobot Snarl transforms into a tranquil Stegosaurus - which is usually looked upon as prey for T-Rex's. Which is a great injustice to the legacy of the Dinobot Snarl if you were to ask us. Presenting Darth Vader - Anakin Skywalker from the Star Wars Vintage Edition Series. Obviously this was what Darth Vader looked like before his best friend and mentor General Obi-Wan Kenobi left him for dead burning next to a river of molten lava on the planet Mustafar. So Darth Vader didn't really spend much time looking like this since he had a busy day: First he cut off Mace Windu's sword arm allowing Chancellor Sheev Palpatine to kill him (Yes, just today it was revealed that Emperor Palpatine's first name is Sheev - I'd keep it a secret to - and he'll be referred to as such in the upcoming book: Tarkin by James Lucerno); assembled the 501st and purged the Jedi temple; said goodbye to his girlfriend, and; flew all the way to Mustafar to wipe out the last of the Separatist council. Presenting the Voyager Class Dinobot Slog - Sludge - from the Transformers Age of Extinction toyline - AOE. 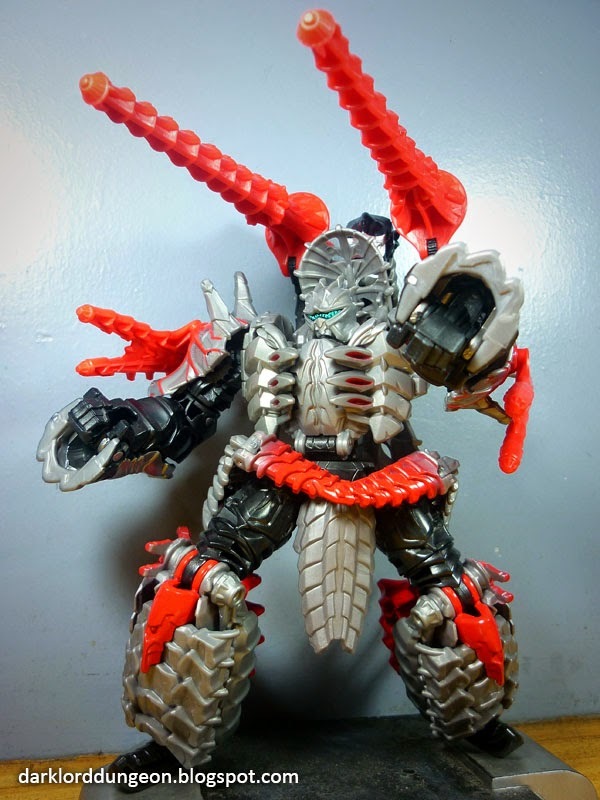 Slog is based upon the Dinobot Sludge. Michael Bay in his infinite wisdom decided that, as with Slug / Slag, that it would be better to call Sludge, Slog. To the uninitiated, Slog is actually a real character in the Transformers timeline. Slog is a Deception Pretender - a robot that hides within the hide of some hideous looking beast and one of the combiners who formed Monstructor. The Decepticon Slog also formed the artistic movement called Slogism which depicted the war between the Decepticons and the Autobots in mangled horrific forms. Michael Bay decided to remake him as a Dinobot. To his credit, Bay also remade him from being a Brontosaurus - a creature that actually never existed and was created out of the erroneous combination of two distinct dinosaurs - to being an Apatosaurus. It's interesting how much our knowledge of dinosaurs has grown since we first saw the Dinobots in 1984. 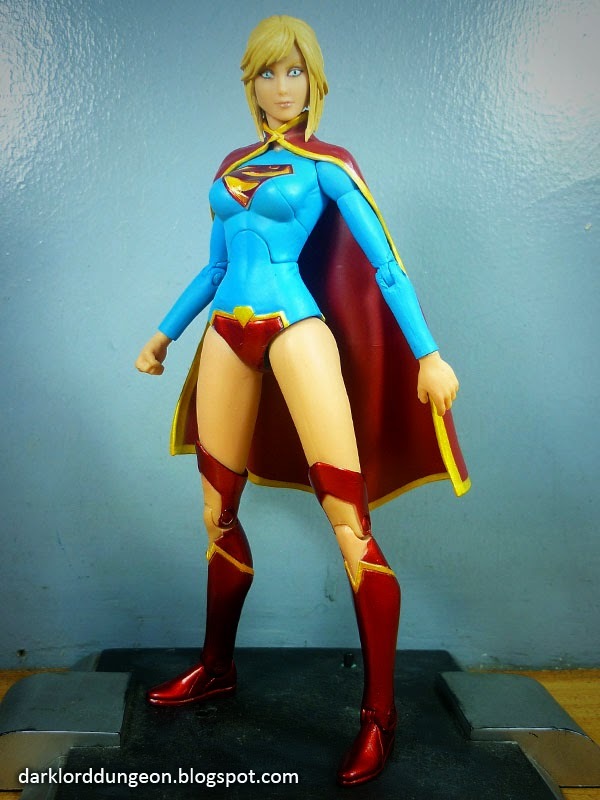 Presenting a Kara Zor-El - Supergirl action figure from the DC New 52 toyline. Too bad DC decided to create her New 52 Red and blues instead of placing Supergirl in her more recent Red Lantern costume. Yes to the uninitiated, having been born to a life of strife, loss and death, the New 52 Supergirl is no longer that teenager trying to find her place in the world, and has instead released her anger and joined the dark side as a member of Guy Gardner's Red Lantern Corp - where cursing your enemy usually results in his/her being barbecued. Frankly we think that the Red Lantern costume is an improvement. Anyway, prior to that, this less "Gifted" (nudge, nudge, win, wink) cousin of Superman - whom she has fought to a standstill - appears here in the a quite unique remodeling of the traditional Supergirl uniform. Presenting the Gatling Gun for Transformers Prime Optimus Prime AKA the Aristocratic Creature Huntsman. 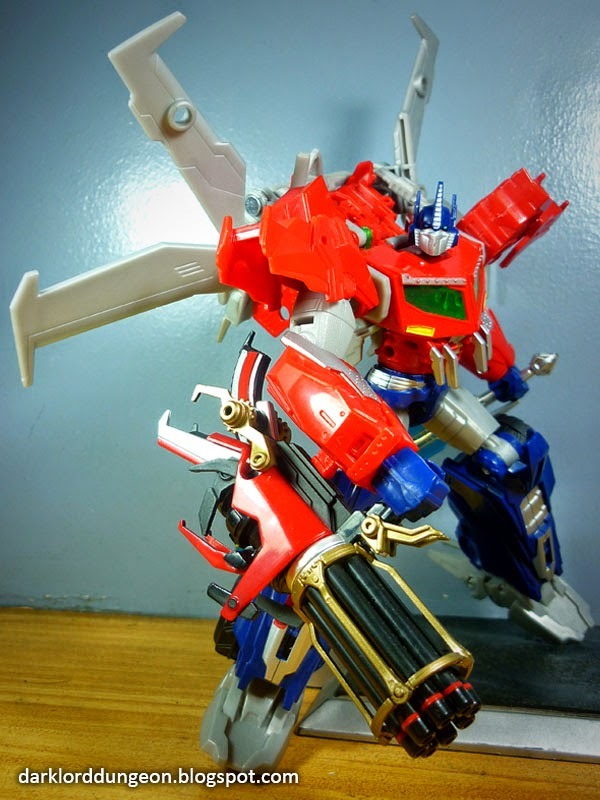 We should note that he's also dragging Dr Wu's Starsaber / Skybreaker. The Aristocratic Creature Huntsman is from Zenith Forge the same people who made the Cretaceous Advancement upgrade for the FOC Grimlock (Which we recently gifted to our Nephew - hope he's still whole). The Gatling gun's ID number is ZF-002. We should probably also take the time to point out that this is technically not a gatling gun as it is not crank activated. It's energy powered so it's technically a mini-gun, or more accurately a weapon's pod. But calling it a Gatling gun sounds cooler. 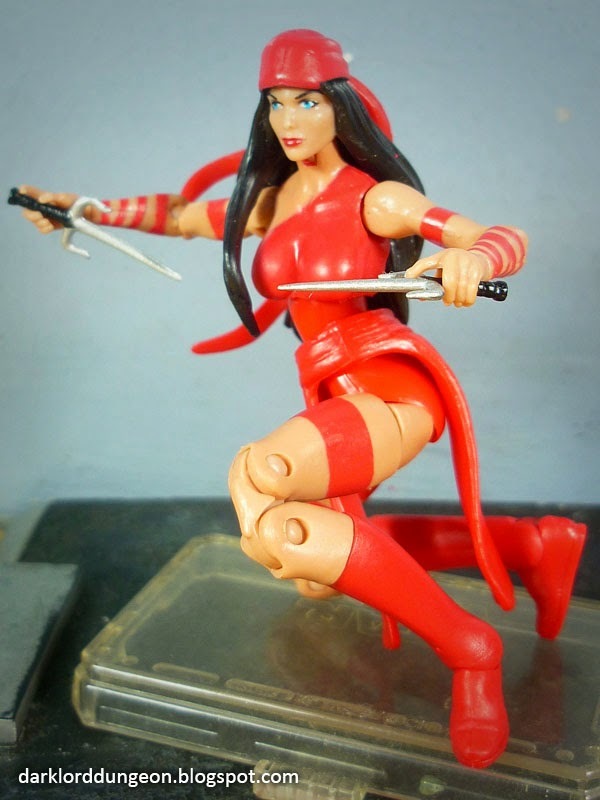 Presenting Elektra from the 5th Series of the Marvel Universe toy line. To the uninitiated, Elektra Natchios is not the Mexican appetizer Foggy Nelson makes her out to be. She is one of Frank Miller's greatest and most beloved creations: a kunoichi (Female assassin), long time flame of the Daredevil - the Man-Without-Fear (The title where Frank Miller debuted); Current member of the Thunderbolts, and; now the love interest of the Punisher (Another title that Frank Miller is famous for writing for). Elektra has had quite a colorful history in the Marvel Universe (And we don't just mean red). She's one of Marvel's more famous testaments to the Marvel Universe statement "Nobody stays dead forever" - what with having been killed by the assassin Bullseye and brought back from the dead by the Hand - hell she even brought Daredevil back from the dead after his death in the Shadowlands series. She is remembered by most as the 1st hero kidnapped for the Skrull invasion. Rumor has it that she was experimented on during her captivity. She's been both a hero and a villain. Daredevil's lover and the greatest thorn at his side. One of those rightfully called an anti-hero.